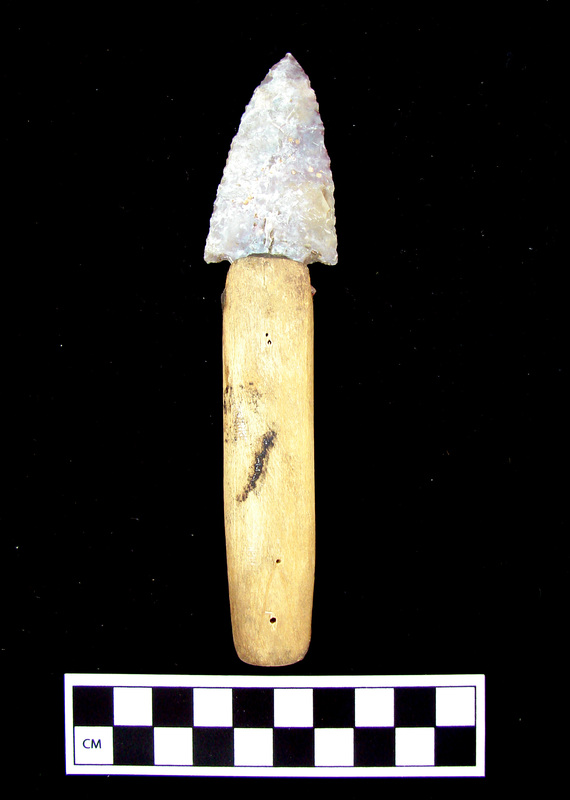 Hafted knife with mottled chert blade and wooden handle from Grand Gulch, Utah, collected by Charles McLoyd and Charles Cary Graham in 1890-1891 as part of the Reverend Green Collection. Courtesy of the Field Museum of Natural History, Chicago, catalog number 121.21451. During the 1890s, more than 4000 textiles, baskets, wooden implements, hide and feather artifacts, and other organic materials were excavated by local “cowboy” archaeologists from Basketmaker and Pueblo-period archaeological sites in the greater Cedar Mesa area of southeastern Utah. Most of these artifacts were shipped to museums outside of the Southwest, where they have been largely forgotten by archaeologists and the public. In 2010, the Cedar Mesa Perishables Project was born to “re-excavate” these collections and make them more accessible to researchers, the general public, and native communities. To date, the project has documented approximately 1500 perishable artifacts and generated more than 4500 digital images of collections at the Field Museum of Natural History, the Museum of Peoples and Cultures at Brigham Young University, and the Smithsonian’s National Museum of the American Indian. Our work with these 700 to 2000-year-old collections has revealed a wide range of well-preserved and often complete wood, horn, bone, and feather implements related to woodworking, hideworking, animal and bird procurement, farming, personal adornment, and other socioeconomic practices. In this presentation, we will discuss some of what we have learned about the use and manufacture of these perishable technologies and how our work with these collections has broadened our understanding of Basketmaker and ancestral Puebloan societies in ways that the study of more durable artifacts cannot.